Due to the large Catholic holiday on August 15th, I decided to hunker down and spend a whole week in the coastal city of Nice. I would only recommend that much time if you are in the mood to relax and enjoy the weather, casino and local bars. Considering it was the beginning of my trip, I didn’t want to spend most of my days lying on the beach but still found fun things to do while I was there. Vieux Ville- The “old city” in English, this was my favorite part of Nice. I walked through narrow streets filled with small cafés, souvenir stands and specialty shops selling Provence lavender, soaps and artisanal cookies. The gelato and pizza stands were outnumbered only by the tourists that shuffled along the cobblestones with cameras in hand. At the center, the streets opened up to reveal a large open market. In the morning, the stalls are filled with fresh fruit, vegetables and fish. In the evening, the food is replaced by watercolor paintings, purses and jewelry for sale. The perimeter of the square is lined with restaurants and outdoor tables under awnings boasting the freshest fish and cheapest wine. Beach- Crowded and pebbly. I would recommend waiting until evening, picking up a cheap bottle of wine and finding a spot on the shore to watch the sunset. Matisse and Archaeological Museum- Not only are both museums free, they are necessary stops in this French city. The Matisse museum is well situated in the middle of a large garden, perfect for picnics and dog walkers. 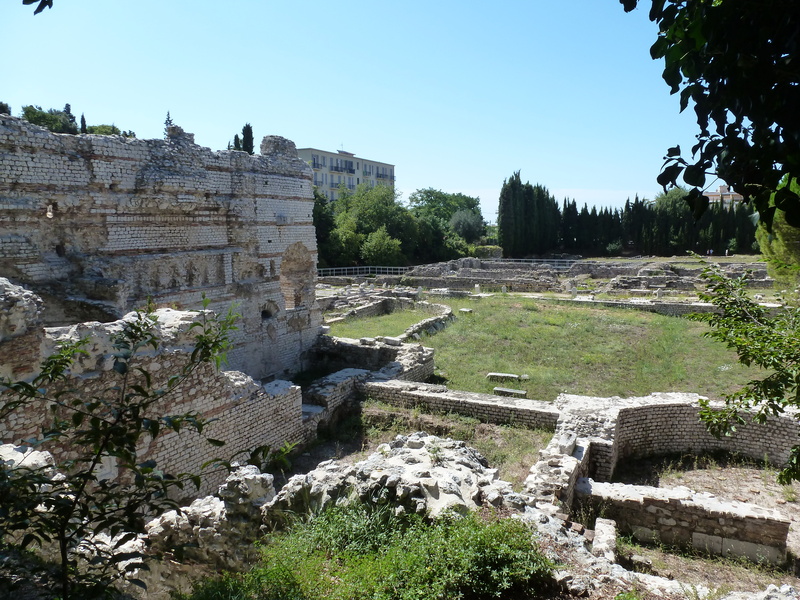 I spent about an hour in the museum looking at the Matisse collection before heading over to the Archaeological Museum to see stone ruins of ancient Roman baths as well as the smallest Greco-Roman amphitheater, well persevered next to the museum’s entrance. Near these two museums is another church with beautiful botanic gardens and an expansive view of the city. 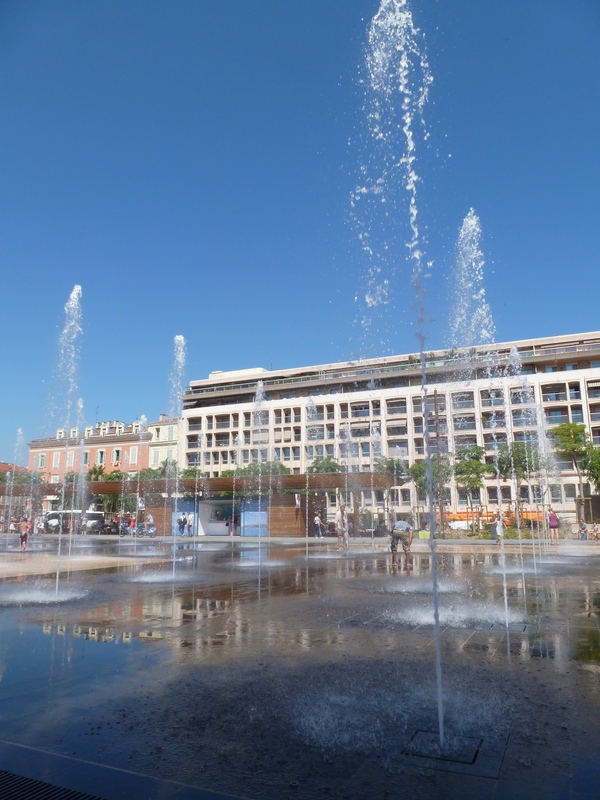 Main Square and Fountains- The main center is perfect for families with children. The wide network of water jets are built into the ground and erupt without warning, shooting plumes of water high into the sky, disappearing as quickly as they come. Kids can also plan in the massive jungle gyms shaped like water creatures located to the east on the way toward the contemporary art museum (also free). I spent over an hour writing on a park bench, listening to the sounds of splashing feet and high pitched giggling. Park- I found a large patch of green in the northwest corner of my Nice map. Feeling adventurous, I somewhat skillfully navigated the network of local buses and made my way to the center of supposed patch of wilderness. My excitement in finally finding the location was replaced with disappointment finding the gates closed with a sign indicating the park was closed for the entire month of August. No one in Italy works in August including the wilderness.